GunLink Online Firearms Portal coverage of the NSSF Shooting, Hunting and Outdoor Trades (SHOT) Show, from Las Vegas Nevada. Keep an eye out for coverage of the latest in firearms related products and technology from GunLink.info before, during and after the show. Be sure to let us know which exhibitors you would like for us to cover so that we can tailor our coverage just for you! The first documented use of firearms was somewhere in circa-12th-century China. While it’s quite clear that firearms and their accessories have come a long way since the first gunpowder-filled tubes, the basic principles remain the same: ignite the propellant and the expanding gasses send the projectile out of the business end of the barrel. For the most part, any advancements since then have been been to make firearms more effective in terms of power, portability and accuracy. 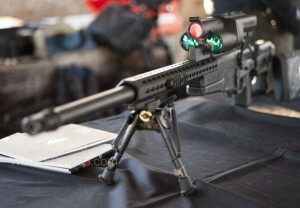 A big advancement in the accuracy department was on display from Tracking Point at the 2013 SHOT Show. 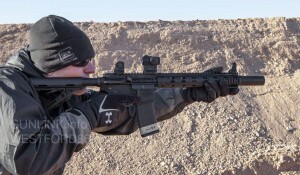 Tracking Point’s XactSystem is a Precision Guided Firearm (PGF), which the company describe as “fighter-jet-style, lock-and-launch technology into a rifle system.” This closed-loop system consists of ultra-consistent ammo loaded by Barnes, a precision Surgeon Rifle with a 22-27″ Krieger barrel and Harris bipod on a LaRue QD mount, and the smart networked tracking scope mounted on top. Given the components involved, the precision of the rifle itself is spectacular, but the scope is what makes the system truly amazing. 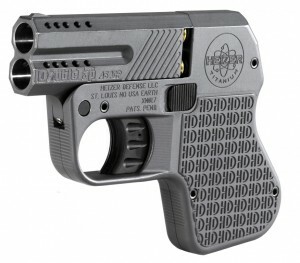 You may remember an interesting pocket pistol, then known as the Heizer Defense DoubleTap, which we covered at the 2012 SHOT Show. 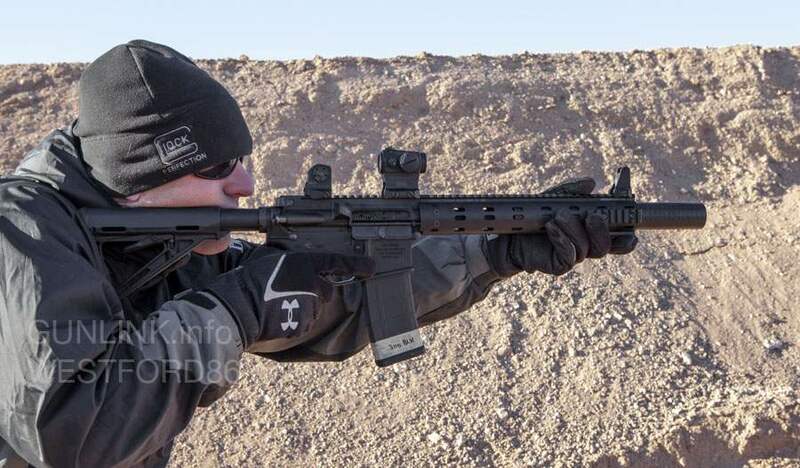 Since then, there have been some shake-ups, including DoubleTap inventor Ray Kohout ejecting from the deal with Heizer Defense to form DoubleTap Defense. DoubleTap has also filed a $6 million lawsuit against Heizer et al. 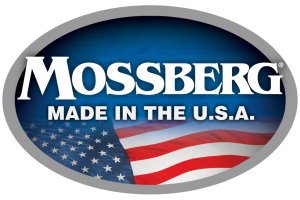 for monetary damages and an injunction against “any further action on the part of Heizer Defense, LLC and others to manufacture or market a product based on the intellectual property of DoubleTap inventor Ray Kohout“. Both companies were at the 2013 SHOT Show and were both still in the hunt for market share for this type of pistol. The newly announced Heizer HD1 pocket shotgun, chambered for .45 Colt and 2.5/3″ .410 shotshells and offered in a variety of materials and finishes, has a similar small form factor with a familiar grip and trigger design. The HD2 model appears quite similar to the double barreled pistol we saw on display last year, along with its two-barrel-single-hammer firing mechanism and a price tag ranging from $489 to $719 with spare barrel assemblies priced at $189 . Heizer has recently made an announcement reiterating their commitment to the project and the company said that they hope to have both units available later this year. Heizer personnel didn’t have much to say about the split other than nodding toward a sign at the rear of the booth noting that they were not associated with DoubleTap. DoubleTap’s booth had on display what they describe as an improved version of the model unveiled last year. Manufactured by Azimuth Technologies of Naples, Florida, the new DoubleTap is projected to hit the market in the first quarter of 2013. The biggest change is probably a simplification of the firing mechanism to use two hammers which operate sequentially rather than one hammer that reciprocates between the two firing pins. The DoubleTap is also available in a variety of materials and finishes with retail prices ranging from $499 for aluminum non-ported models to $799 for ported titanium models. Spare barrel sets for converting the pistol between 9mm and .45ACP range in price from around $200 to $269. 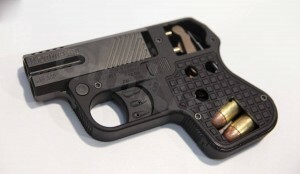 One fellow SHOT Show attendee, while viewing the double-barreled pistol in the New Product Showcase, asked “What’s the point?” Whether it’s to meet a low-capacity firearms restriction, to have a last-ditch backup gun or to have a tough, dependable firearm for your glove compartment, tackle box, etc, it looks like this design would meet those needs (albeit, at what seems to us to be a relatively high price-point for something in that role). 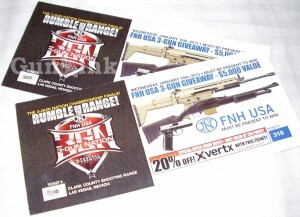 Stay tuned to GunLink for future updates on the Heizer/Doubletap split, lawsuit and products as well as more from SHOT Show 2013. The 2013 NSSF Shooting, Hunting and Outdoor Trade (SHOT) Show is in full swing, but the action isn’t just on the show floor. 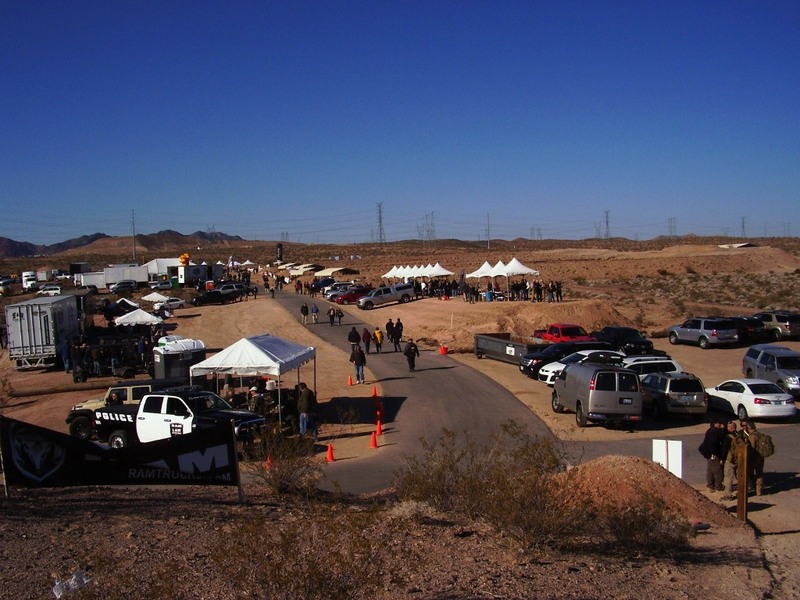 On Monday, January 15 – the day before the official start of SHOT Show, registered media attendees had the opportunity to travel to Boulder City for SHOT Show® Media Day at the Range™ at Boulder Pistol & Rifle Range. While there, we had the opportunity to get hands-on time with some of the latest and greatest gear on the market – and some that isn’t even on the market yet. 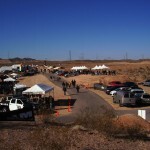 Some of the highlights from this event included new offerings from SilencerCo, Glock, FN, and others. There was also plenty of cutting edge optics, long range rifles and AR platform innovations on display as well as the latest hunting and target shooting gear. With everything going on at the range (as well as on the show floor), there is a lot to write about. We’ll be putting up more details of all this amazing gear right here on the GunLink blog in the coming days but, in the mean time, the GunLink Forums are an excellent place to find more information and share your thoughts. While Media Day at the Range was a great opportunity to get some trigger time with the newest firearms advancements, we didn’t have a chance to really put the weapons through their paces. We’ll leave that to the pros at the 3-Gun Nation championship on Wednesday night. The “Rumble on the Range” will showcase 3-Gun pros vying for $50,000 at Clark County Shooting Range while other 3GN top shooters will be gunning for $5,000. The 3GN competitors won’t be the only ones with a chance at great prizes; one lucky match attendee will be walking away with an FNH USA 3-Gun prize package worth over $5,000. A live performance by Mark Wills and a side-shoot sponsored by the American Silencer Association cap off the event, which lasts from 6PM to 9PM. Stay tuned to GunLink for updates from the show floor and from the range as this 35th edition of SHOT Show rolls on. I first became intrigued with the Heizer Defense Double Tap when I saw an ad for it in the NRA’s American Rifleman magazine. 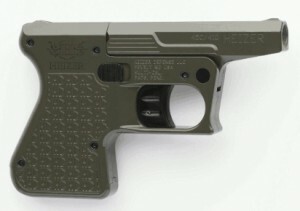 For some reason, there is something I just can’t resist about this type of pint sized pistol. The DoubleTap, available in both 9mm and .45ACP versions, comes in a package significantly smaller than other firearms in the same class. In fact, Heizer bills the DoubleTap as “the world’s smallest and lightest .45 ACP concealed carry pistol on the market today.” At just 5.5 inches long, 3.9 inches tall and less than 0.7 inches wide, the DoubleTap can easily disappear into a pocket or purse and be at the ready should you need it. With both aluminum and titanium models available (weighing in at 12 and 14 ounces, respectively), the pistol won’t weigh you down either. With only two rounds chambered and another two stowed on a speed strip inside the grip, some people might feel a little under-gunned with that low of a round count. The DoubleTap might not be the right choice for someone who wants to be ready to take on a small army but it definitely looks like it would serve its intended purpose of offering .45ACP stopping power in an ultra-concealable package. This makes the DoubleTap perfect for a last-ditch backup gun or an EDC concealed carry piece for someone who wants to keep size and weight at a minimum.